Yesterday (Feb 4th) saw the launch of an organisation. While Social Media was abuzz with rumours and gossip about the Virat-Anushka split and launches at the Auto Expo, something of far greater import was making its presence felt. Their front page advertisements in National newspapers went, “Sometimes silence does not speak louder than words”. 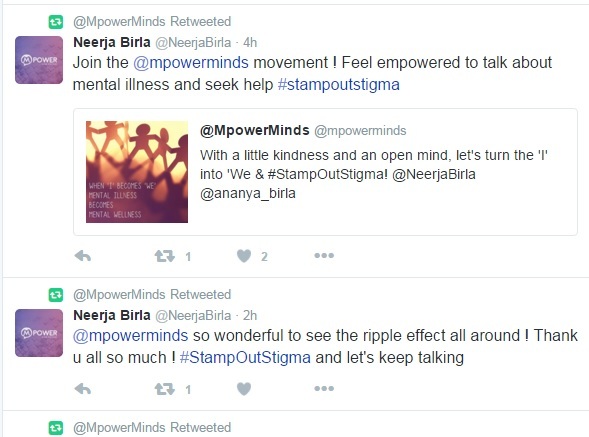 Neerja and Ananya Birla of the vast global conglomerate Aditya Birla Group had announced their plans to support the #STAMPOUTSTIGMA campaign. Having interacted with Ananya a day earlier on Twitter through my compassionate and ever supportive friend, Meenal Jaiswal, I already had some indication of this. A commendable initiative from an industrial house known for their penchant for philanthropy. This holds tremendous hope for the India MHA scenario. Why? Well, Bollywood Superstar Deepika Padukone set the tone by disclosing her own battle with Depression and launching her Live Love Laugh Foundation to support her cause (Hat’s off to you brave lady!!). However, it is comparatively limited in scope. Also, how much time would Deepika personally be able to devote to this cause, (not questioning her commitment to it) is anybody’s guess. With MPower Mind Matters, we are talking about an organisation with the backing of the infrastructure that comes with the renowned Aditya Birla Group. 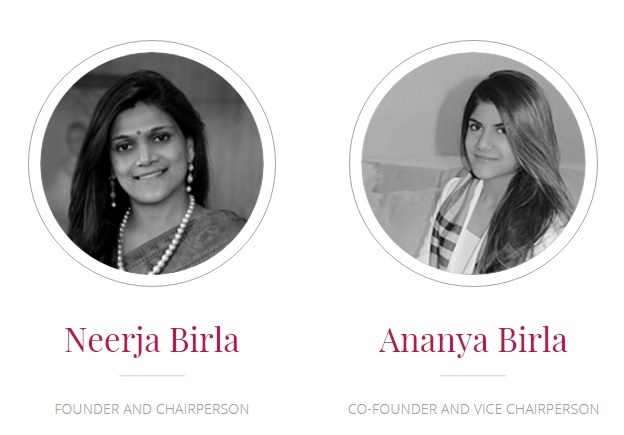 Not to take away anything from the ladies, Neerja and Ananya~ surely, they are no strangers to organisation, team management, mobilisation of resources and monitoring. The potential for this thrust to make deep inroads is exciting. For one, they are the first movers on this scale. Secondly, they have all the capability to action their dreams. A dream combination, certainly. So, congratulations to both of you, your team and down the line, I am sure thousands will have genuine reason to be thankful to you! What does it mean to those looking for Mental Health Support? Does it bring new hope in terms of any real improvement in the lives of those challenged? The soon to be launched MPower Foundation promises to do just that~ it hints at economic support to marginalised sections of society. Nothing has sounded sweeter than this in a long, long time.. I had a look at the Website. Honestly, this short video did not manage to touch me. Also some facts have been distorted: Bipolar is not just about swings in mood between euphoria and depression. I myself as a Bipolar am testimony to this and most of you here would know~ there are many Bipolar II patients who do not experience full blown mania at all, and languish in depression for years. However, I understand this film’s intention is not to inform about symptoms but sensitise the audience to the suffering that the mentally ill have to face. So, full marks to the intention and the buzz it has managed to create. Also, some important data quoted on the site is in urgent need of correction for the figures are way off the mark. Thank you DNA INDIA for this article which clarifies the GOI Health Ministry stand that a scary 70 Million Indians suffer from some sort of mental illness. I don’t blame the organisation for this error. Transparency in reporting of Mental Illness in India being pathetic, reliable data is difficult to come by. Years of research (for this site and for my Book) made me explore beyond known sources. What really interests me most, is something altogether different from the topic being discussed. The writer-artist in me looks at things in a different sort of way.. The launch of MPower Mind Matters and their soon to follow Foundation has intrigued me no end. For, it is one heck of a story. These are truly gorgeous women~ not just in looks but because their hearts are compassionate. And they backed their vision of compassion with action. They are the kind of Heroes one can look up to for inspiration. The ones who choose to make a difference when it is so convenient to look the other way. And of course their able team who help execute their plans. The writer in me urges me to write a story on the people behind this magnificent story. I am a people’s person and I am deeply interested in knowing what drove these pioneering ladies to chose this as a cause to support. Surely, so many other worthy causes must have caught their fancy. What is their vision for this magnificent dream of theirs? Something deep within me tells me that a revolution in this much neglected area has quietly begun. Onward, with hope and gratitude. The Author or this Site has no Affiliation with MPower Mind Matters. This post is purely in appreciation of the bold initiative by the organisation to help the cause this site represents.